A delicious, juicy, sweet version of pizza pie. Lots of fruit and creamy cheese with strawberry sauce. Easy to make using commonly found ingredients. This is such a fun recipe! It makes a great dessert because it’s so sweet, but it’s fruit and nuts and also makes a super healthy breakfast or snack. The date and nut crust pairs perfectly with the fruit! To make the crust, in a food processor fitted with an "S" blade, process the walnuts and dates until they're ground up fairly well and start clumping together. Press into a dinner plate or pie plate (or a small pizza pan!). 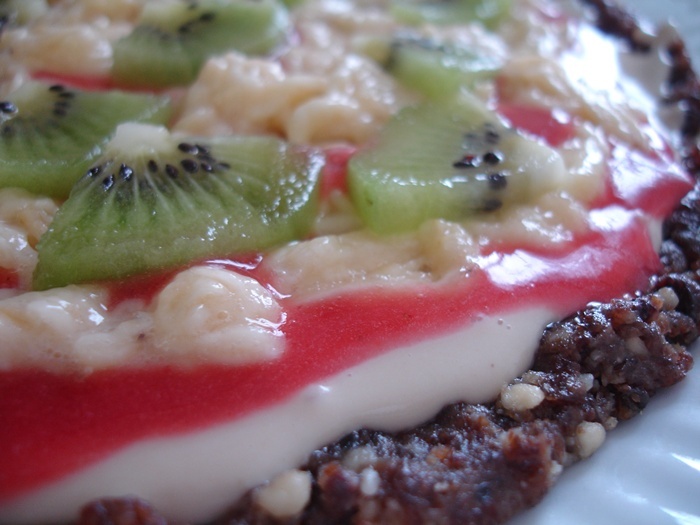 To assemble, spoon a layer of cashew cream on the crust, spreading almost to the edge of the crust. Spoon a layer of strawberry puree on top of the cashew cream. Sprinkle the grated bananas over the strawberry puree (the bananas will be a bit gooey, so it takes a bit of finessing). Top with the cut kiwi. Let chill in the refrigerator for at least an hour before cutting into pizza-shaped wedges and serving. Want more fruity desserts? Try these! A tasty, creamy mango dessert! Just fruit, nuts, and chocolate!